Yes, it certainly has been a long time between posts hasn’t it? Not feeling the mojo these days and have been spending lots of time outdoors with my flowers, garden etc. 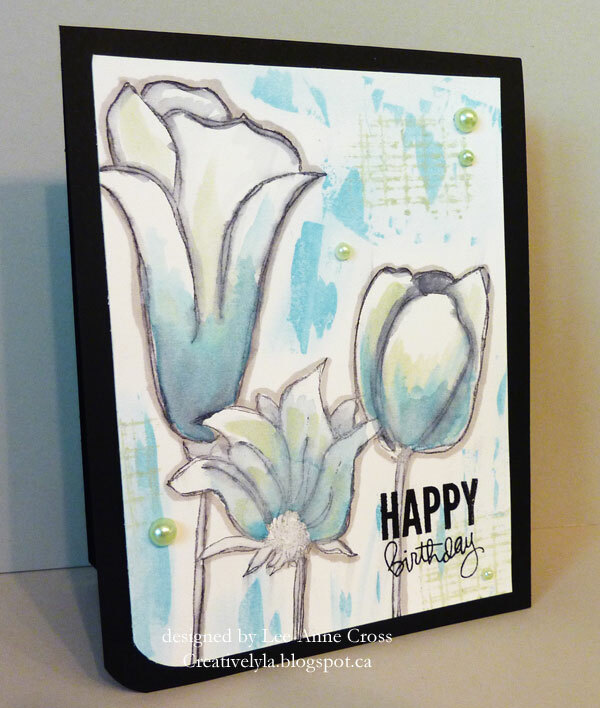 Dina has asked us to use some black shading on a stamped image today for the Mix-Ability Challenge over at Splitcoast. I started out by stamping the floral image with Black Soot Distress Ink. Then I used my waterbrush to pull the black out in certain areas to shade the flowers. Next I used my waterbrush to add some color with Distress Paints. Then I added more shading with the Black Soot Distress Ink. A Copic marker was used to outline the flowers too. For the background…Distress Paints applied with a spatula and a stamp. And, for the embellies…some pale green pearls. Hope you have a wonderful weekend…back soon with more! You know I love flowers so this beauty is making me smile 🙂 Have a whole new respect for mixed media after trying it for the first time for the Diva Dare – not that I didn't before, but there are so many wonderful things you can do I can see why it would become addicting LOL! Gorgeous work on this card! Beautifully done! Such a serene and soft look you created!! !